If there's one thing I'm good at, it's paying off debt and saving money. (Is that two things?) Anyway, it's the whole reason I have been able to be unemployed and irresponsible for the last two years. Which is why I love today's Friday Blog Love. This shout out goes to Anna at And Then She Saved, a cool chick who paid off more than $17,000 in debt in the span of just over a year and lived to tell the story. And you know what? The main thing she did to accomplish that insane task was to STOP SPENDING. She's currently SAVING money. So cool! 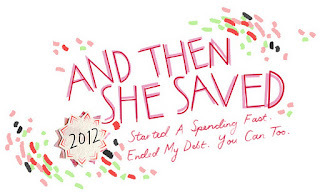 I love her Spending Fast...and her Spending Diet...and how she documented every penny of savings here. She's even going to be on the Nate Birkhus show! (And I'm very excited about this...) You may recognize the author of her guest post today. Thanks for including And Then She Saved in your Friday Link Love! and thank you for sharing your story with my readers! You are so awesome! Thanks for sharing! I love it! I also love that you never appeared to be depriving yourself during this time. I am f***ing kowtowing to you. Wow, Kady. Write a book.